Australia's population of 'ultra wealthy' will jump 37 per cent over the next five years as rising property and equity values boost fortunes and the country continues to draw wealthy immigrants, Knight Frank says. The buoyant conditions accelerating the growth in numbers of ultra-wealthy globally will in this country lift the number of people with net assets of $US50 million ($64.5 million) to 1,720 by 2022 from 1,260 last year, the real estate agency's Wealth Report 2018 predicts. "We've seen significant growth in prime property prices" said Michelle Ciesielski, Knight Frank's Australia head of residential research. Last year's Financial Review Rich List showed a surging property market, a comeback for manufacturing, strengthening iron ore prices and high performers in the technology and financial services industries pushed the total wealth of the country's wealthiest 200 people to a record $233 billion, with an average wealth of $1.16 billion each. The Wealth Report shows the effect of rising global wealth on premium property values. Even as the pace of growth in Australasia slowed to 7.1 per cent last year, the region was the best-performing globally for the third year running. 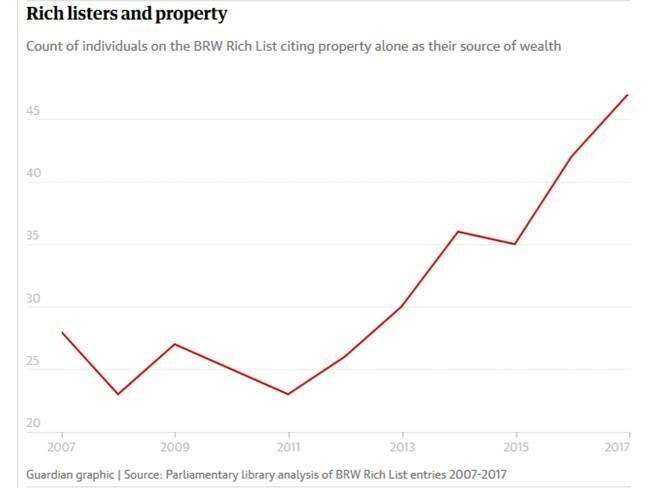 Of the 200 wealthiest Australians, in excess of 25% now list property alone as their source of wealth, a statistic that has more than doubled since since 2007, once again showing property to be the path to growing true wealth in Australia both on the Australian rich list, but also for the average Australian looking to secure their future. While the US has 44,000, or just over one-third of the global total of 129,730, China is the fastest-growing region. That country's number of ultra-wealthy will more than double over the next five years, the report says. Other Asian countries will also post strong growth, including Japan (51 per cent), India (71 per cent), Indonesia (66 per cent) and Malaysia (65 per cent).